RFDTV has finally let the cat out of the bag and is letting affilliates know about Branson plans. This tip originally reached me back in the summer when Patrick Gottsch was negotiating for a theatre in Branson. RFD-TV has strong ties to the area broadcasting Branson entertainment to a rural base for some time. The demographics of the satelite network are a good fit and close access to Branson talent could yield big rewards. Among the talent being cultivated for the small screen - Jim Stafford worked on a "tonight show" type program and it's very possible that Darren Romeo, who has been working on a reality show, is doing such with RFD-TV (Will confirm when information is obtainable). They met with a number of entities in January including the Branson Chamber of Commerce and local powerhouses to reveal some of their plans and setup shop with technical assistance from Nashville. It's likely that the theater will be producing content within a month. What happened to Wirestreams? As financial troubles arose Wirestreams took something of a nose dive. Personal pockets couldn't support the giant and each business unit was left to sink or swim. In a sense, Wirestreams opened Pandora ’s Box, proving lucrative numbers could be generated online. It's possible that a good production online could yield larger results than the satellite network itself - something RFD-TV is doing with legacy products as they enter the Branson market to capitalize on the offering's of the live entertainment Mecca. A rollout of an online television product appears to be in development at RFD TV. 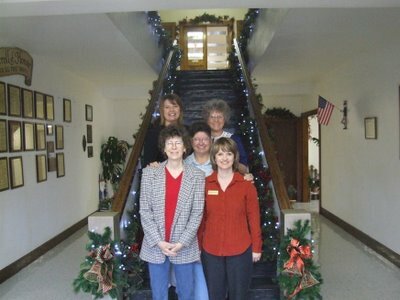 Will RFD's broadcasts from Branson generate visitors or keep them home? So far, other entities, such as the Haygoods have offered video offerings outside of their live Branson product with decent results. Early experiments by the Branson Edge proved the viability of an online digital television product as well. 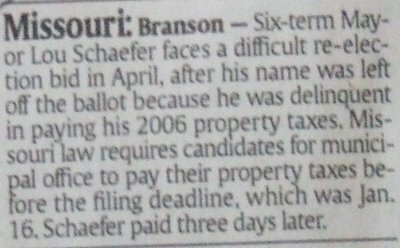 The Mayoral race in 2003 represents a dark chapter in Branson, Missouri history. Ethical violations resulted in visits from the State Ethics commission. One local editor recalls a "street walker" apparently bribed with the lure of hard liquor to place an insertion order into the local paper. I fully intend on publishing some of the details of that year elsewhere in hopes this type of campaigning will never happen again. One candidate from the 2003 election was asked, "Will you run this year", his official response was, "Not no, but hell no." I have never experienced poverty like I have during the Branson off-season. In many ways Branson is the ultimate Libertarian realization. Entrepreneurial opportunities are abundant and with longevity can be realized; though the transient nature of the community means unwariness about new-comers and the ideas they bring with them. I’ve seen great business ideas fail while waiting for community trust to yield a green light. Each year the gap closes – the season extends - and the idea of a year long flow of industry comes a step closer to reality. The Chamber of Commerce has engaged initiatives such as Hot Winter Fun designed to promote tourism during the off season. Some businesses are creating their own brand of demand creation. The Titanic has made an effort this year to start a few new traditions. From a New Year’s fireworks show (which I hope the city allows next year) an annual ice sculpture contest and tricks yet revealed the museum’s effort is creating demand for Branson when the streets are empty. Other commercial ventures bring promise as well. Digital television initiatives, still unveiled offer Branson entertainment products which don’t demand traffic buildup on highway 76 ; however, as of today, layoffs are a part of the seasonal flux which most workers prepare for and the unemployment lines resemble Silver Dollar City during the peak season. Mayor Lou Schaefer may have an easier time being re-elected than earlier thought. As noted in a previous post the spelling of the Mayor's name could provide a challenge. Good news for Lou though; Missouri election law holds the standard of counting a name on a ballot as "intent". If it's determined that a voter intends to cast a ballot for a candidate then the vote for the candidate will still count whether or not the spelling is correct. This low res video clip is of James Bescher at this trial in Christian County where he was convicted of 1st degree murder three hours after this statement was given. In the above clip ex-Branson resident James Bescher gives details including meth use - visits to aforementioned time share salesperson Marsha Chambers interaction and details before and after the shooting. 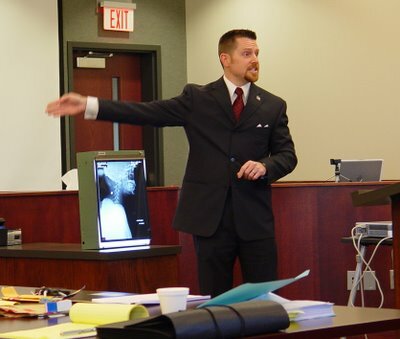 Cross Examination conducted by Tim Finical aka Dr. Death who has a record of 378 Wins 17 Losses as prosecuter. After three sleepless nights I wrote the history of your sons day in court. Emotionally, physically and mentally exhausted I sent clips to the radio stations, photos and eventually copy to the newspapers. I made three mistakes which I'll correct this week and correct as I elaborate on the details in next weeks Taney County Times. I know they told you not to talk to me and I never pushed until the last night when both of you confessed your thoughts. It's been hard on me, hearing your sons stories and I've learned my skin is not as thick as thought. I understand why reporters stay in the safe confines of the air conditioned newsrooms. It's costly in every concievable way to interact and force ourselves to feel what you feel as we see what you see. I do not think or pretend to understand what you've been through the last 5 years as you waited for to witness an uncertain fate. I write today for the benefit of each of you and confess that I tried hard to keep my poker face and hold back my tears on your behalf. Jeff Merrell said it best, "Two mother's lost their sons." Both of you have secretely confessed a desire to speak to each other and I hope the day comes that you can communicate - perhaps a good cry is in order and perhaps a reality I can share will help lighten your burden. Life is a gift - though life came thru you it never came from you. Though you had a child that child was never yours. The same is true for your own and until you can tell me what it was you did to make yourself come to be I shall beleive no different. This life is a terminal illness and on the same day one of your son's was sentenced for another one's death the oldest woman on record passed. She was 114, and if you lived this long you'd be a record holder to. Point is, we were here before and will be here after this life. Josh White's mother said she's "going home to bury her son." In a way, Josh died long ago the grips of his existence held firmly by the Meth Amphetimines that mastered his temparement. He was so young and showed signs of promise - he was going to try to get help. Josh White's mom said that she worked with Judge Williams an left Josh in jail for three months as a show of tough love. I went with you into this dark culture of Taney's underground meth scene where death was close reality as a way of life. What may, would or could have been we'll never know. They were both young and the hand of god moves quickly at a will not of our own. Our earthly lives are only borrowed. Josh's mom revived Josh 30 times as he "officially died." I want to share a secret....there is a part of us that lives forever and if there is vindication it lies in forgiveness. By forgiving we kill the demon. Josh and James were once friends and James mom told me of her shock when she found out about James actions ...especially becuase it was Josh. James never let the demon go and his mother's advice was to get some boxing gloves, settle the beef and continue their friendship. Having met you I believe that our community hasn't seen the last of you and though we saw the dirt that took these boy's lives; remember, it's dirt that flowers roots take hold in. Jeff Merrell gave a sigh of relief after the jury was dismissed and the judge read the verdict, "Guilty of murder in the first degree." It was Jeff's first taste of the other side of the courtroom. In the photo above (click to enlarge) Merell points to James Bescher while conducting closing arguments. The x-ray generated image shows the bullet in White's neck and the gun that killed White can be seen on the table. It took five years until that fateful moment and 13 more days before a term of life in prison is delivered to James Bescher. Jeff's first trial was a success and the family of Bescher expressed both gratitude towards Jeff and anger towards the legal mechanism that slowed a swift hand of justice. After the trial Jeff credited law enforcement agencies "that made the prosecution possible." Jeff handled the jury like a conductor of an orchestra. Trusting my camera to catch witness reactions I allowed myself to watch the jury as Jeff played with the buttons on his jacket before rapid moves towards the person on stand. The jury’s eyes moved with him with the exception of one who was paying attention to the back show. Insiders will confess their are times when the prosecutions has to push losing cases for the benefit of victims; but, this time the score is Criminals 0 Merrell 1. The prosecution has only a few witnesses left to present. Chances are good that the prosecution will finish presenting witnesses tomorrow at noon. The video clip posted above is of defense attorney Dale Wiley as he presents opening statements. Dale presented Bescher as a meth addict and dealer as opposed to positioning him as a fine upstanding citizen; specifically, he used the term "Methed Out Punk". 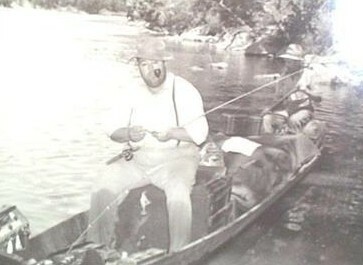 The overwhelming evidence, interactions and dealings of Bescher made the "boy scout" approach impossible. In the clip above Wiley is addressing the testimony of Nicole Smith. Today, a day after this video was shot, Nicole Smith testified that her occupation was "hustler" and that Bescher had supplied meth for her to distribute. The basis for the prosecution's case is that the murder of Josh White was premeditated provable through statements made to Nicole Smith. Testimony submitted by Smith contradicted earlier testimony Smith submitted when deposed by the defense. 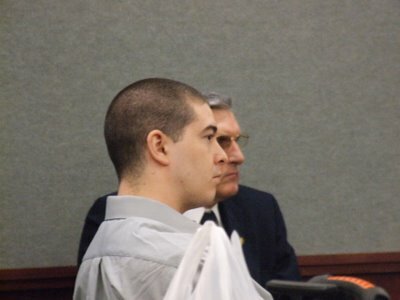 The dispute is over whether Bescher's threats to kill White were legitimate as opposed to figurative or spouted out in a moment of anger months before the slaying of Smith took place. Smith's transient testimony is as transient as her living patterns as Smith explained several moves since the murder of Smith took place. When deposed years ago Smith took Bescher's threats lightly credited to his youth. Other accounts by Smith indicate detailed threats of what would happen to her family should she testify about the Bescher/Smith incident. Smith testified in court today that Bescher threatened to call a woman identified as time-share salesperson Marsha Chambers, who would have Smith and her two children killed if they testified. According to Smith Bescher claimed he could have the threat carried out from prison through Marsha's association with a hit man. We are our own worst enemies and today this was clear on fronts other than my personal front but on many I witnessed in Branson, Missouri. 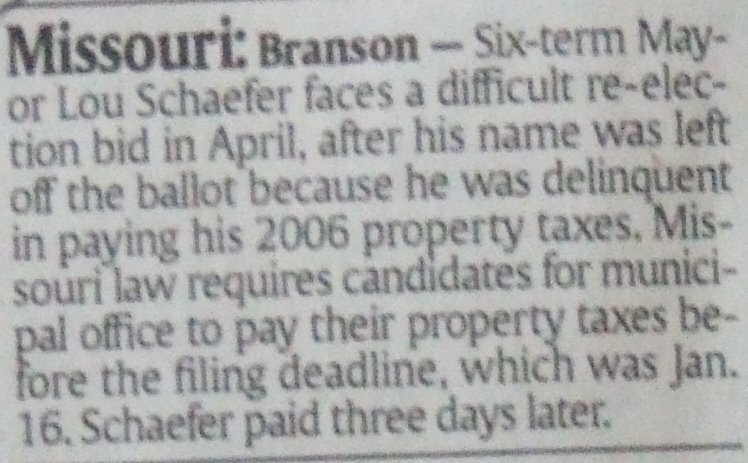 Reanne Presely Likely To Be Branson's Next MayorCurrent Mayor Lou (Did I spell that right) Schaefer was taken off the Mayoral ballot due to a shortcoming in submission of his tax bill. Lou admitted to making the mistake and was taken off the ballot as required by law. Unfortunately, his name is difficult to spell (most of us double check it before spelling it out in public). "Aren't you glad his name isn't Bob Smith? ", joked a smart mouthed reporter to Lou's political contender. 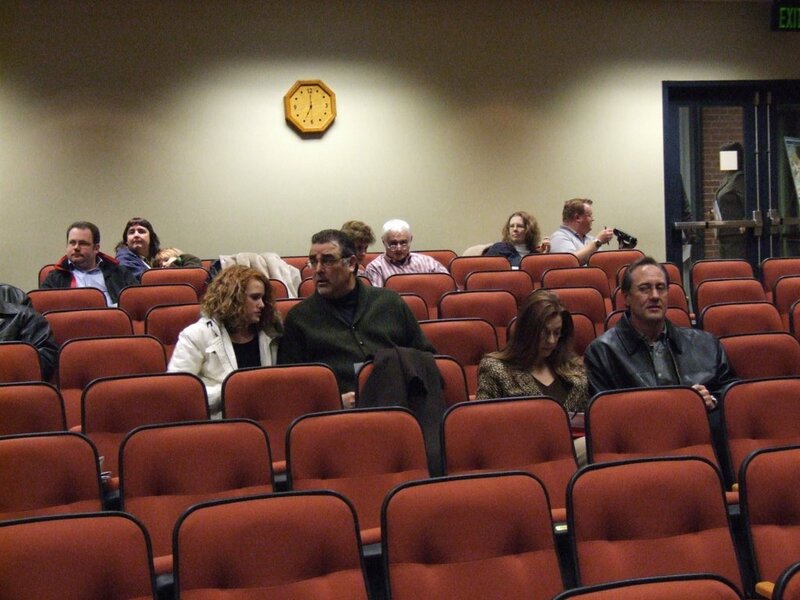 Political candidates are beginning to appear at the City Governments meetings. The two you see above are the frontrunners and probable victors in their upcoming bids for Branson's Leadership. One because his contender has no experience, is grossly incompetent, recovering from a bankruptcy and probably submitted his candidacy as a ploy to manipulate a judge during his divorce trial last week and the other because her contender has too difficult a name to successfully defeat her as a write-in candidate. At the Christian County Courthouse today we covered the James Besher trial for a murder committed five years ago. After a seven hour jury selection process a 10 woman and 2 man jury were selected. 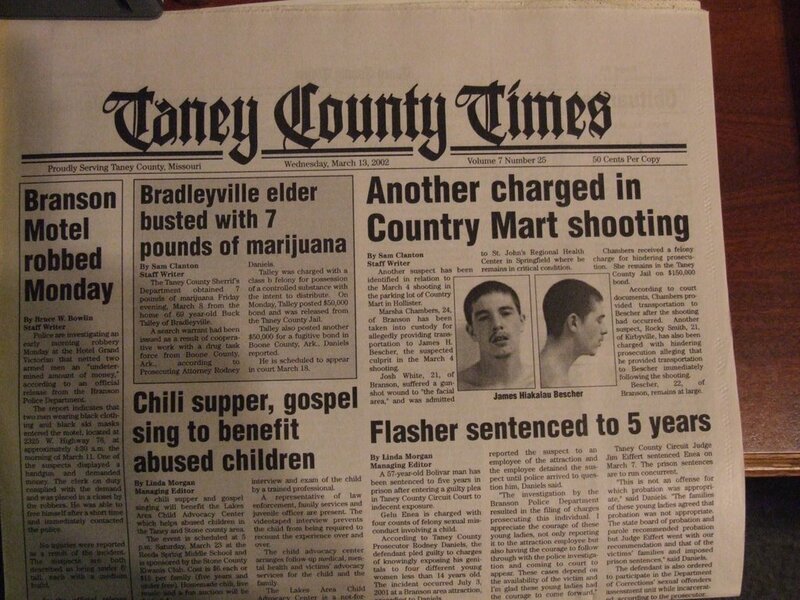 Both the victim and the defendant are from Branson. The murder was committed in Hollister at the previous Country Mart location and the suspect was arrested at the Welk Resort days later. His defense attorney didn't try to categorize him in the light of perfect citizen but rather as a meth addict and distributor confirming innuendo referenced in the prosecutor’s opening statements. Three witnesses to the crime were questioned earlier today....more to come....The man who wrote this post was the only reporter on the scene and has hereby been crowned "King of The Media Pool". If a KY3 reporter steps in front of me as he waltzes in on the last day of the trial - I'm going to take him out. Due to the impact that such a statement may have let me be clear....I will turn the camera on him, switch to live feed and give him a nougee before I rightfully apply an atomic wedgie. Ye are warned. The Sprinfield News-Leader will read. Greatest wedgie of all time delivered on national television. Folks, and I'm speaking to my elders in the government - send out a press release to set the record straight when something goes down. ...Please? When something really good happens we can't stop the fax machine....you dig? This is a quick rerun of the last 18 hours in Branson...through the eyes of the newsroom. Last note - If you're ever misquoted ...let the paper, blog, radio station know. They'll help you set the record straight. They love the truth - you can help by sharing it. The interview posted above was conducted in October. We cover two topics, the first is a 1931 Hudson Jim built from scratch - we'll be pulling up video from the archives later today for your viewing pleasure. The car itself is quite impressive as is Jim's path from a modest wage as craftsman Silver Dollar City to the powerhouse he is today. A month ago I found Jim laying out the plans of his Antique Car Time/Distance/Speed rally to none other than Shoji Tabouchi. As I understand it, Shoji will be a partipant though what make of car he'll be driving wasn't revealed it's certain that it will be something car guys will be drooling over. At the time, Jim wanted me to hold on the story until he gained a few commitments from a few Europeon players who'll be participating in the event. My gut is that Jim has gained the commitment of these players of which he'll be announcing at the Branson Alderman meeting Monday at 7:00PM. They call themselves the Branson Believers and thier rituals involve more than a secret handshake. They follow underground stream of extroadinary force and bring them to the mainstream to be honored in a very public manner. There are those people who you come in contact and leave changed. They're unprompted, unscripted and for the most part publically unidentified for what they unconsciously emit. 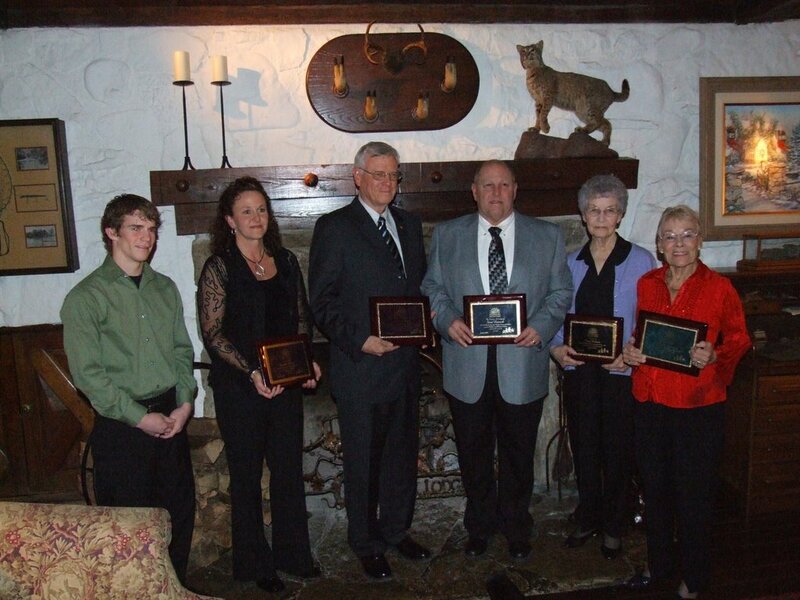 This secret society holds a dinner once a year where 4 individuals are seduced into coming to Big Cedar Lodge for a fine meal unaware of the honor they are to recieve. Personally, I've been affected, altered and inspired by three of the five individuals ...my life and many others forever changed by our chance encounters. Dean Dickens who volunteers for Skaggs and many other support groups. Jolie Justus had to wait 17 hours for Senator Bartle's voice to silence. The Senator was attempting to block the gubernatorial appoinment of Warren Erdman to the Missouri Board of Curators...the issue - the Republican Warren's stance on stem cells. The aforementioned article about Senator Justus and her Branson roots was printed today on the back page of the Stone County Gazette, earlier this week page 4 in the Taney County Times and last week on the front page of the Branson Daily Independent. The article reveals Jolie's support of all of her "Goobers" and waited until the 17th hour for Bartle to step down from the microphone. I took the opportunity to listen to a few hours of the historic marathon talkfest and was amazed at how interesting Senator Bartle sounded, particulary the air of conviction expressed as he educated us on how many pounds there are to a bushel of soybeans (60 lbs in case you were wondering). ....but Senator Bartle's effort today was impressive and courageous. I disagree 100% with his message, but I have a new found respect for the controversial senator. He was wrong to filibuster this appointment, but I fully support his right to do so. At the close of session this morning (after 3:30 AM), my first stop was in Senator Bartle's office to thank him for his courage. He stood up and expressed his beliefs in the face of pressure from every person in the senate, his party and his governor. He kept all of us from sleep, from our families – but that is what makes the senate such an amazing place. Each one of us has the power to stand and fight for our constituents and our beliefs. Only in the senate can this take place. The senate was designed to be a deliberative body. One that moves slower. Where fair and free discussion is encouraged. A 2.9 million dollar increase in tourism funding was the gift delivered from Jefferson City. Representitive Dennis Wood credits hard work and Governor Blunt's appreciation over how important tourism is to the state. An interesting conversation with our Rep. will be posted later. Branson Area Official Says "I'm Not A Puppet of the State"
James Strahan, Taney County Assessor, took his fight to Jefferson City last week to bring the standoff between the Missouri Tax Commission and Taney County to an end. The tax assets's office funding is split evenly between the County and the State. Missouri halted their half of funding before Christmas resulting in layoffs of several officials in the office. December 06 taxes collected have provided funding relief for the office since the state began the fiscal strangulation process for Strahan's non-compliance. Strahan's argument for not increasing the taxes by the rate suggested by the state is based on a three year index as opposed to the states formula based on 2006 data. Strahan argues short term trends fail to reflect the real value of property and the state of Missouri is playing a political game for reasons other than those placed on the table; specifically, financial and legislative interests from the urban parts of the state. Strahan withholds an agreement reached between Missouri and Taney County wasn't honored after the state received MLS (Multi List Service) data from a local real estate agent. 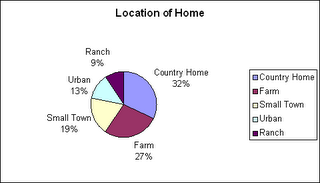 Older homes and a hot trend in Branson area real estate are two underlying issues behing the debate. County formula's are based on what it costs to buy land and build in addition to a sample of sales data aquired through the office. The sample used is based on a few hundred transactions gathered each year. Not everyone agrees taxes are properly assessed, local attorney Harry Styron takes issue with the way commercial property is assessed claiming current income should be a factor in determining property value. Taney County Commissioner Danny Strahan openly criticized the press for not mentioning/printing 6 letters from the office's laid off employees affirming support for the Taney County Assessor's office policies. Chuck Pennel and James Strahan briefly squared off briefly yesterday over the timeline for rehiring the laid off employees. Chuck questioned why they weren't hired back immediately, Strahan is pushing for legal counsel's advice and possible actions from the state before taking his staff off unemployment. In an interview yesterday, Straham said, "I am not a puppet of the state, I was elected by the citizen's of Taney County...."
Reanne Presley announced she'll be in the race to become Branson's next mayor. Her bid for mayor came at the last day for filing (as of this moment you have 3.5 hours left to file). Until Presley filed at City Hall Mayor Lou Schaefer was running for his 7th term unopposed. Presley, who served as an Alderwoman from 85 to 95, if elected, would be the first female mayor ever elected to the position in Branson. When life gives you ice storms make ice sculptures. While our neighbors to the north faced power outages from ice storms 300 lb. blocks were being shipped to the parking lot of the Titanic Museum in Branson, Missouri. 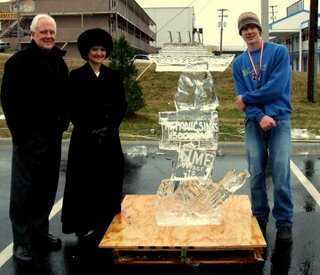 The National Ice Carving Association (NICA) held their first professionally sanctioned Branson event in this weekend at the Titanic Museum. Contestants had five hours to create an artistic ice sculpture relating to the Titanic. The themed event was unusual as most NICA events are in freestyle form giving artists the ability to create whatever they feel comfortable with. Judges scored contestants on 11 attributes from first impression to structure technique. All three judges participate in events as well giving them a solid understanding of the complexity and skill level each piece requires to produce. The overall winner was John Flottman from Oklahoma City. 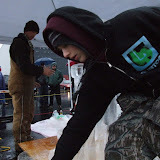 His piece titled “Titanic Collaged” featured Time Magazine and newspaper headlines below a carving of the Titanic itself. The video at the top of this post shows how the two blocks were fused together. Taking a chance is part of the game. A difficult piece can be a risky endeavor. The two video clips below illustrate the concept Alex Moore was attempting to piece together. Unfortunately, Alex was unable to fuse the captain’s wheel to the post. After a second attempt to weld the two pieces together Alex dropped the Wheel losing what would have most likely been the top placement. The two clips below show Alex at the halfway point and Alex attempting to place the wheel on the base. Kirby Van Burch Auction Disappears. A representative from Carol Jones almost witnessed the event but was wandering around the courthouse trying to confirm the wisdom of a local reporter. There are those that seek but never find (our readers excluded). Kirby, who has the reputation for being "overly cautious" ....ok...downright paranoid...had the original title ammended in October to include a 10,000 dollar a week fee for his services. In addition, transfer of the Magical Palace, was to be transferred to Bambi Productions, Kirby's wife,in the event "something happened to Wirestreams". It's ok to be paranoid if someone's out to get you or if someone's trying to destroy your business partner. Judge Orr made his second appearance yesterday at the Taney County courthouse. The 31st Circuit has yet to post local court rules yet no changes are expected (Associate Judges have made no requests for changes in the rules). After an incident with a local reporter - ....let me stop here. When a public official or office decides it's time to tell the public something it will be blindly regurgitated for consumption. I would like to publicly apologize for the regional media outlets failure to make an effort to "report news" and thank them for making sure I know what Paris Hilton is wearing and the relationship status of Britney Spears. A media coordinator who doesn't know the color of the rug at the Taney County Courthouse will most likely be assigned next week. In support of my comrades and to ensure the national trend continues this post will not contain what was actually witnessed. I've been assigned to cover a murder trial next week at the Christian County Courthouse. All the media outlets will be there. I'm sure of it...press releases will be issued at 11. Jolie notes “3 hours with a Branson Independent Reporter” as a memory of her first week in the Missouri Senate. Jolie was interviewed several times. 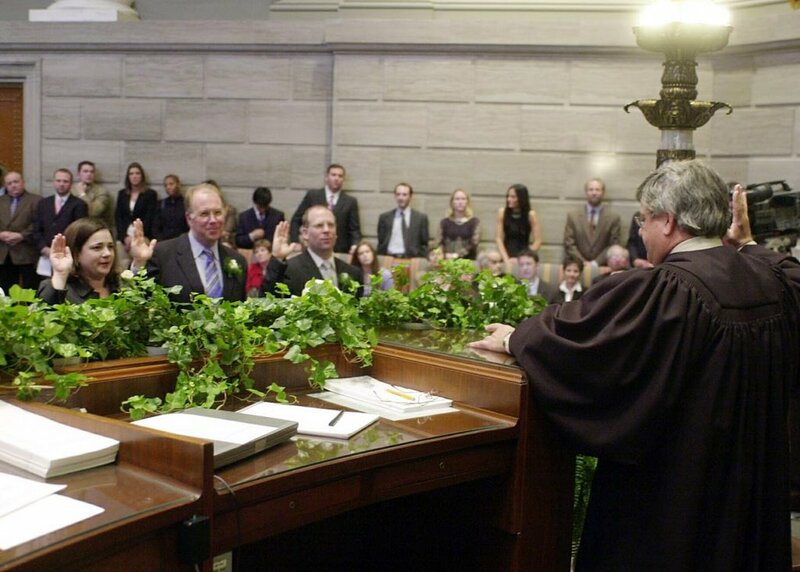 Our first conversation occurred a day after she took her oath of office at the capitol. A second interview was conducted while she was on a train ride from Jefferson City to Kansas City and generously grandted an hour long interview over the weekend. I’ve spent many hours between interviews contemplating her story. You can read the story in the Branson Independent tomorrow, next week in the Taney County Times and if you were listening to Branson Hometown Daily News you’ve already heard a piece on the local radio stations KZRK and KOMC. The “sensational” piece was an easy write. The politics of Jolie’s sexual orientation provided material enough for the front page of the paper. Political factions were eager to share perspective, dialogue and even criticism of the status quo. Locally, many remember Jolie and her “husband”, who was the best friend she loved and married. He lobbied for her win and was touted by Jolie as her number one supporter helping her pave the way to Jefferson City where she holds Missouri’s Senate’s District 10 seat. Today, Jolie has a “domestic partner” and tomorrow …who knows. I don’t want to paint Jolie as wishy washy because such a statement couldn’t be further from the truth. The fact is Jolie is a person true to her convictions and though 76 percent of us living in Branson believe these convictions to be false (liberal politics) Jolie no longer lives here. The gay lobby, Jolie points out, is sought after by political hopefulls at every level of Kansas City's government. Although I didn’t want to focus on this portion of Jolie’s personal life, a major component of her public persona, it seemed too great a compromise of journalistic integrity to leave this part out. Sexual orientation isn’t something people in Branson tend to wear on their sleeves. There is a strong religious vain in Branson providing a pillar of our social construct, but, we’re not on a public witch hunt either. Public condemnation is not our sport of choice nor is blindly following the trends of our nation. She brings hope to many people that struggle in the early parts of their lives; spent her high school years restricted for not reaching the highest marks in school and is testimony that “not reaching your potential” doesn’t mean won’t. Jolie eventually graduated in the top 10 percent of her Law School’s graduating class. She’s hasn’t forgotten where she’s from and promises to remember us while she serves in Jefferson City. Jolie is Branson’s daughter and Kansas City couldn’t have picked a better place to choose a leader. Lieutenant Jason Sandvos a volunteer firefighter for the The Southern Stone County Fire Protection District responded to a report of a house catching on fire this afternoon. The house happened to be his own. 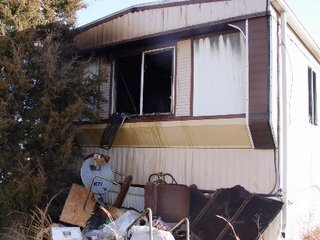 As a first reponder Jason helped contain the blaze that totaled the mobile home. Becuase of the close proximity to the fire station Sandbos the fire was contained quickly and some of his personal belongings, ie clothes were recovered. A devastated Sandvos fell to his knees in shock after the fire was put out. A fellow firefighter offered Sandvos a place to stay while arrangements could be made. A fund for Jason has already been established. Donations are currently being accepted at Ozark Mountain Bank and can be deposited in the firefighter's name. A benefit "luncheon" is currently been planed as well. A press release will be issued later this evening. The report will include the fact that the fire began with a malfuntioning common cell phone charger left plugged into an outlet. **Correction: Sandvos was working a day shift; which is paid. Sandvos volunteers in addition to his regular daytime duties. Volunteer firefighters go through the same certification as their paid co-workers. Firefighter 1 certification involves 4 months of training a practical and written evaluation. They put thier lives on the line when someone is having the worst day of their lives. Let's help him with his. 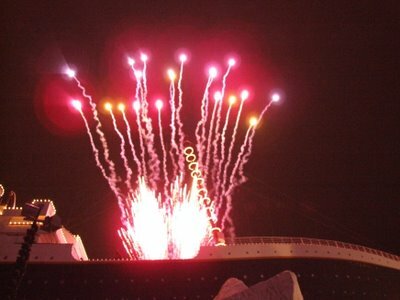 Branson's New Year began with a bang. We traveled to various venues around Branson town shooting photos which were published this morning in the Branson Daily Independent. Venues captured include the 500 dollar a seat celebration at Chateau on the Lake, Grand Country, White House Theatre, Outback Pub, Tsunami's, Shake It Up Show Club, Jim Stafford and the Titanic Museum. The clubs were crowded as expected and the chill in the air left the Titanic Museum with a moderate turnout and wins the award for the most innovative, providing a great addition to the Branson New Year's Tradition. Usually, visitors to the museum are randomly distributed a boarding pass with a name of a passenger which may have been a 3rd, 2nd or 1st Class Passenger. On New Year's Eve only first class boarding passes were issues. In addition entry fees were waived, glowing necklaces issued and all visitors were given a commemorative coin. As the countdown to the New Year ensued a lighting rod was lit and rockets launched at the stroke of midnight (Seen Above). Stone County has its first Recorder. Amy Jo Larson was officially sworn in at the Stone County Courthouse last friday after which she occupied the office where she complimented staff (seen above) who she's been learning from. November's election marked the first time Stone County resident's were able to vote for the position.